A school girl and bicitaxi driver go about their daily lives. Bicitaxis are relatively new to Cuba and are not legally supposed to carry tourists. 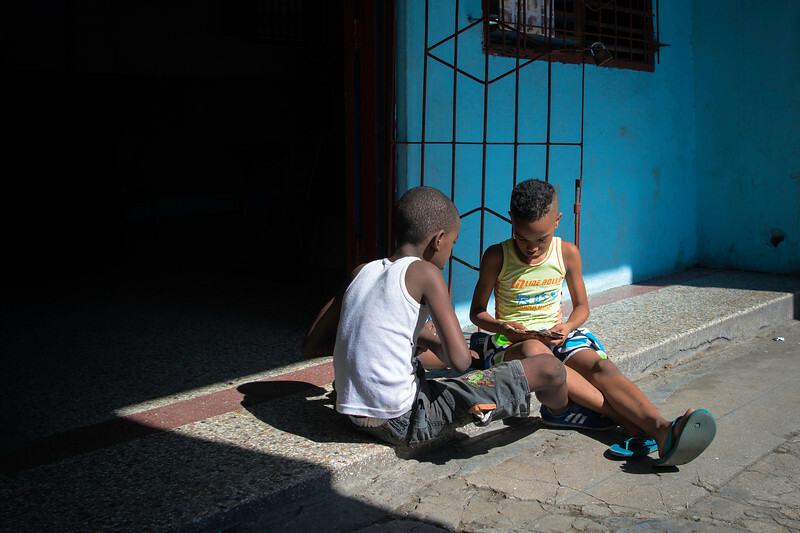 These boys were intensely playing cards along Simon Bolivar and initially did not notice the camera. Once spotted, they begged for candies instead of money. Though public pay phones are still used in Havana today, many people now have access to cell phones. With a storm on the horizon, huge waves crash along the Malecón. 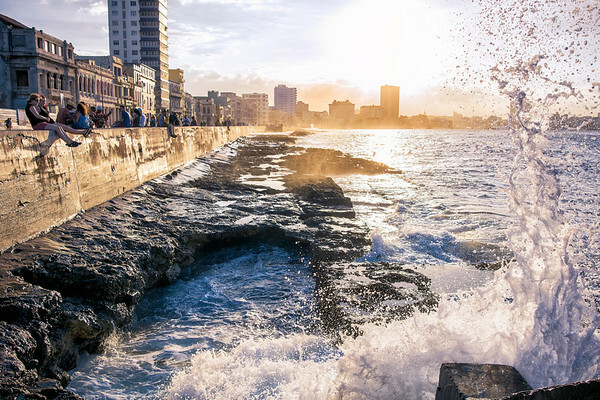 This seawall was initially constructed in 1901 to protect Havana from the ocean. It has since become a popular hang out. At all times couples, friends, fishermen, drink carts, and or tourists can be found here enjoying the open air view of the city. What a great place to be at sunset! 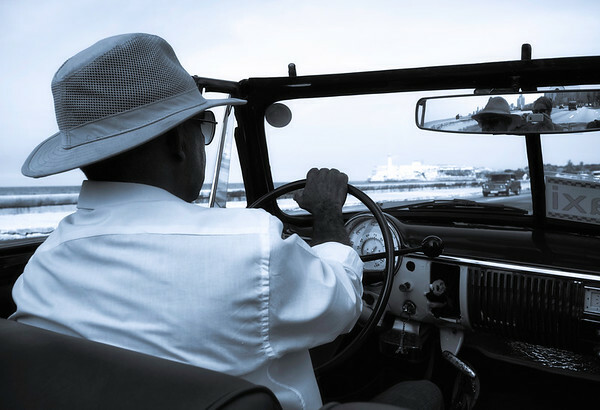 Ironically "Classic Cuban Cars," are vintage American built automobiles mostly from and before the 1950s. They have been maintained by creative means during the embargo, often considered family heirlooms, passed down through generations. With a nice car, or owning any car, comes status, pride and the opportunity to make good money driving for tourists. One remaining Cuban flag waves in front of the U.S. embassy in Havana. 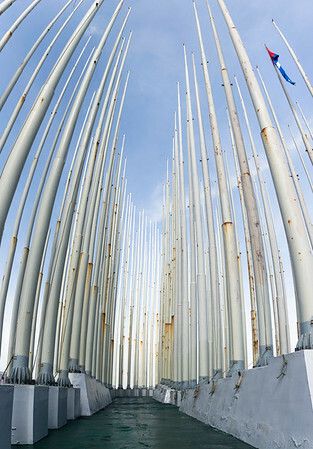 The Mount of Flags, a structure of flagpoles was built in front of U.S. embassy in 2006 to block the embassy's electronic billboard from spreading American propaganda. At one time, there were as many as 138 Cuban flags flying! This image was captured prior to Trump's inauguration and just after Fidel Castro's death. I wonder how many flags are flying now? Tourism is the hottest market in Cuba. Driving taxis, renting rooms, and serving food for tourists is providing a "new money" class. Taxi drivers can make more than 30x the monthly salary of a physician! Since the government provides education, the professional is almost indentured, earning paltry amounts. Taxi drivers must pay steep tax and strict licenses but have a great opportunity to earn well beyond the average government wage, the equivalent of $20/month. Standing next to the Cohiba factory after more than half a century of regulations issued by the U.S. Department of Commerce and Treasury. For 50 years, Americans had not been allowed to legally enjoy an authentic Cuban cigar, which today remains rated at the best quality in the world. John F. Kennedy famously stocked up on 1,200 of them before imposing the 1962 embargo. Years later, when restrictions were initially eased, American's were limited to purchasing only $100 of goods. But since Obama's further easing of restrictions in January 2015, Americans who are authorized to travel to Cuba can now bring home more than the initial $100 worth of Cuban rum and cigar for personal consumption. Cheers to hand rolled Cohibas!! Owning cars, let alone repairing them, is such a rare luxury that their owners are some of the most cautious drivers you'll ever meet. We only witnessed one accident during our time in Cuba, and though only a fender bender, had enough emergency personnel on scene for a serious accident. Taking care of your car means less maintenance costs, that you have the potential to earn money and more importantly, that you have a car. 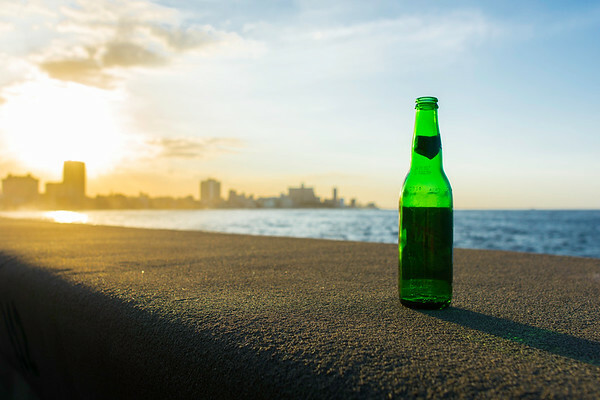 A tribute to one of the thousands of Cristal cervezas enjoyed over the years along the Malecón at sunset. Art in Cuba has a distinct blend of influences from Africa, Europe, South America and North America. Angel is a local artist who sells his unique sketches on the streets of Havana. Though he struggles to keep a steady hand, he continues to put his sharpened pencils to paper. When approached, he held up a self-portrait from a younger, better time. 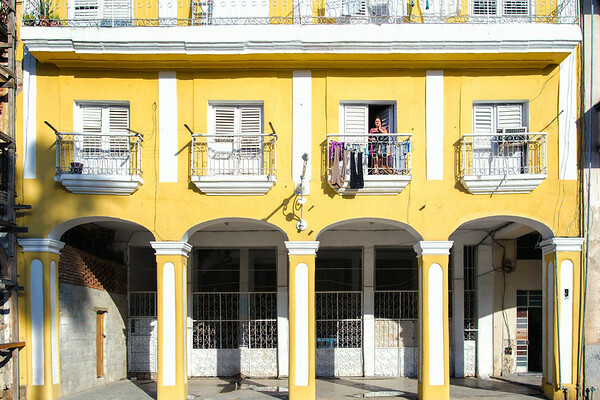 In Havana, balconies can serve as a gossip forum, space for drying laundry or just watching the people go by. They can also provide better entertainment and social interaction than a television or the internet. 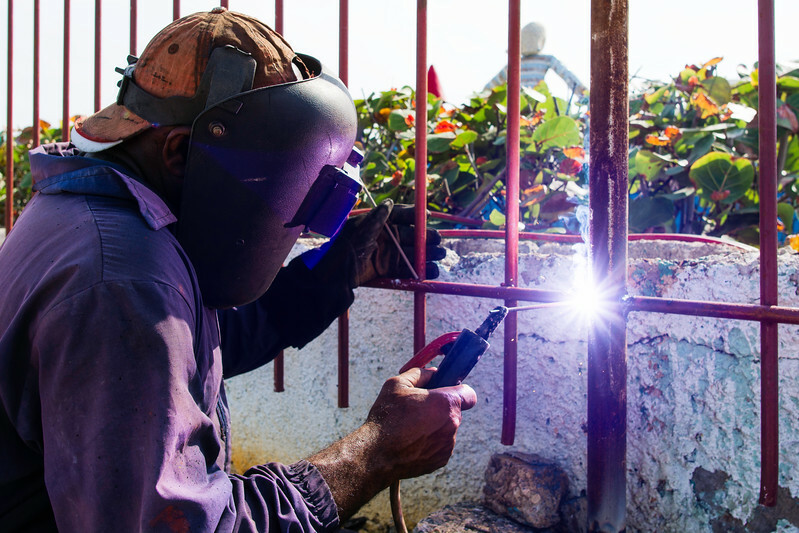 A welder replaces a rusty fence with a new reinforced one at a children's park along the Malecón. Despite the dangers of welding, this man chose not to wear a protective glove on his right hand for reasons unknown. 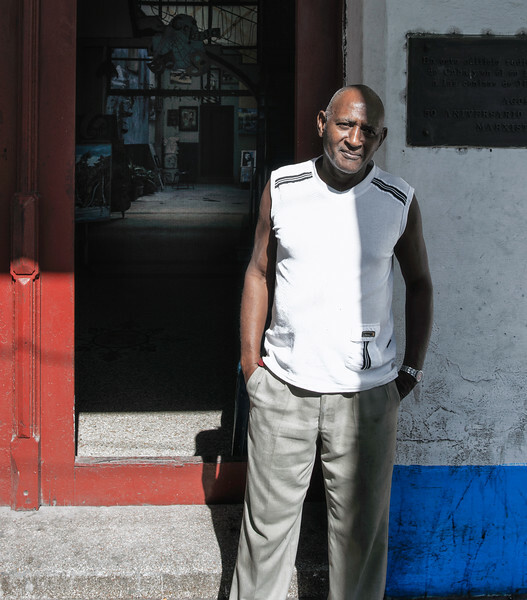 Cuba is home to be some of the most influential and vibrant music in the world. 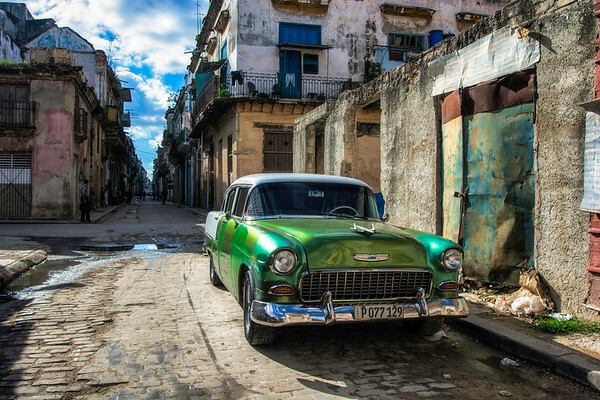 Merging the rhythm of Africa and the melody and harmony of Spain, Cubans have taken traditional music and developed some incredible new genres like Son and Rumba. 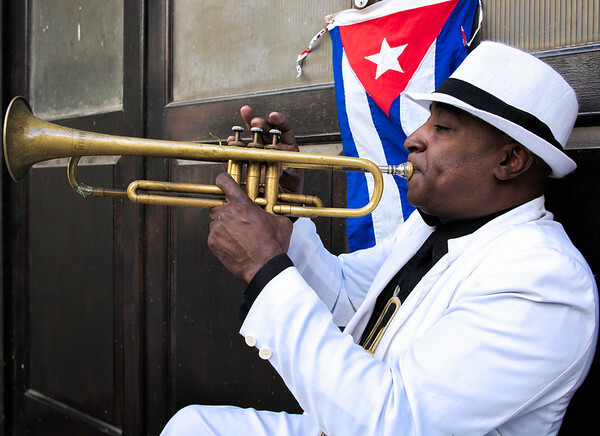 Everyone loves music in Cuba and it's common to hear lively music break out any time at almost every street corner in Havana Vieja. This particular gentleman has been making a living in this location for some time. There are numerous photos around the internet of him passionately playing his trumpet to passing tourists. 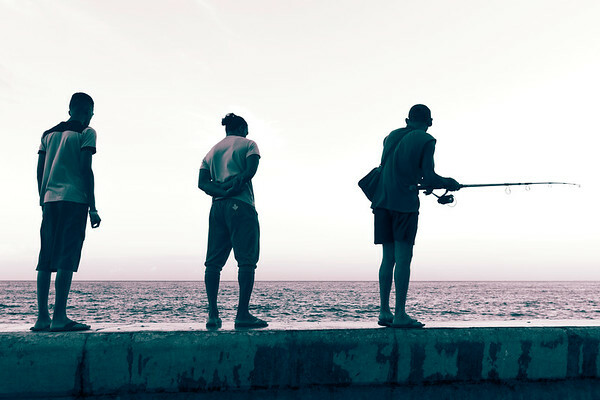 Fishermen hope for a good catch along the Malecón at twilight. Recent common practice is to use government subsidized condoms as "balloon fishing," to catch bonito or red snapper. The condoms cost less than a cent and the large fish can be sold for an average month's salary. 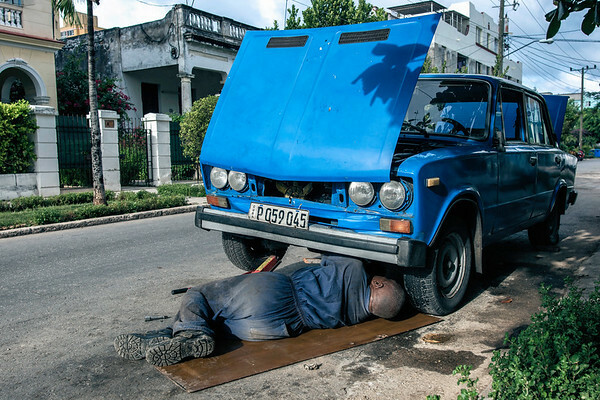 A great example of Cuban ingenuity, solving problems without wasting money on them. Sitting in the middle of Habana Vieja (Old Havana) this beauty soaks in the early morning sun. Habana Vieja is the most popular destination for tourists and the main streets are usually packed. 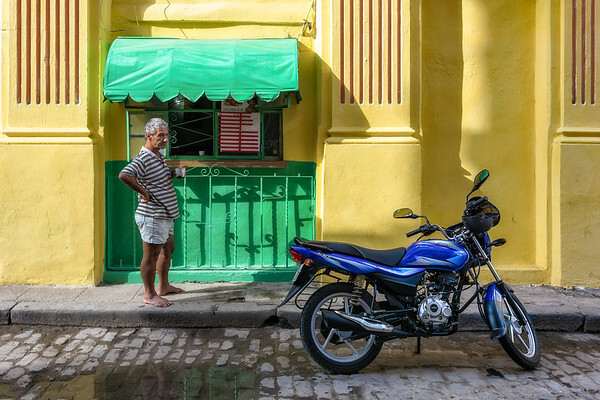 But if you step a few blocks away, get up before the crowds and in between cruise ship arrivals, you can get an authentic look at daily life in the most historic neighborhood of Havana. 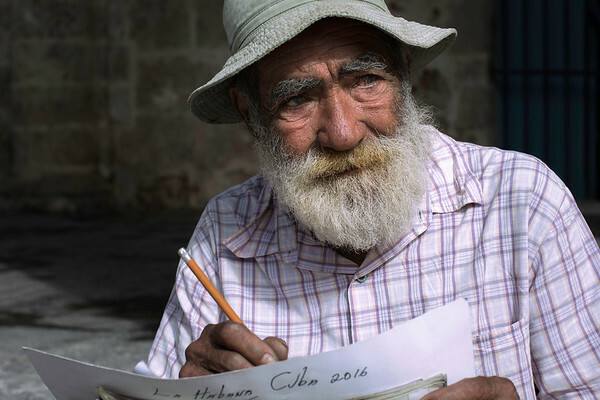 In Havana, it's common for neighbors to check in on each other day to day. An open window is an open invitation to catch up on the day's events. 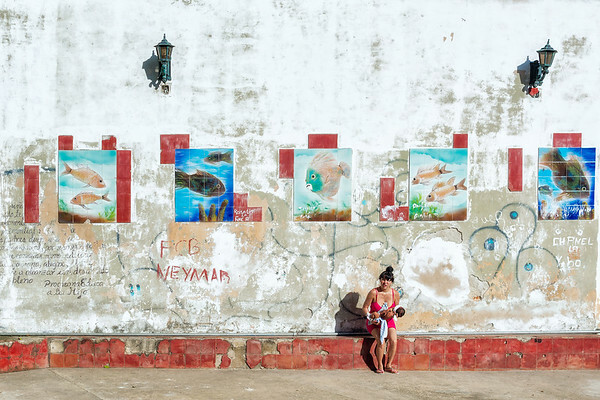 Art galleries in Cuba tend to be government sponsored, giving artists an opportunity and place to present their work and giving the government a cut of the proceeds. 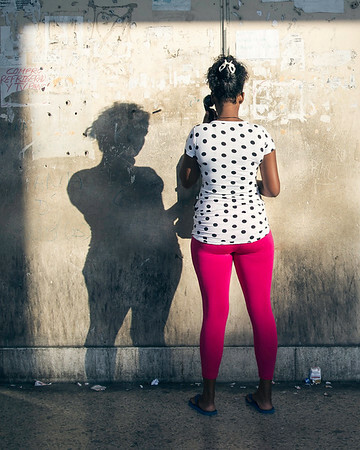 While there are no restrictions on street art, to take art from a gallery out of Cuba, the government requires an official receipt or an export permit. But don't let that dissuade you, a piece of Cuban art is a piece of Cuban culture. 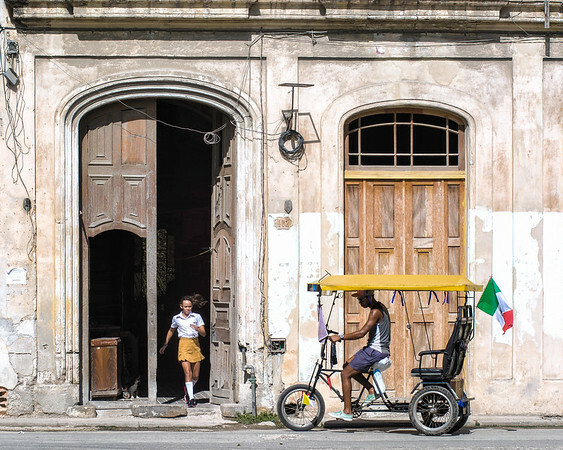 Author Rachael Weiss once wrote "Every Cuban is an artist and every home is an art gallery." From our experience, it's hard to disagree! In a socialist society, waiting in line for rations, or affordable public transportation becomes common place. There is no rush, but rather you ask who the last person standing in line is, "¿Quien es el último? ", in order to claim your spot. 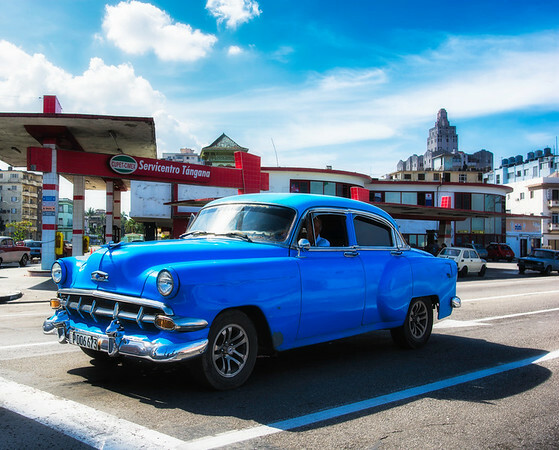 Carlos Ruiz de la Tejera once said, " Havana is a marvelous city. It's the city of lines. Lines to buy bread, bus lines...lines to buy soda. 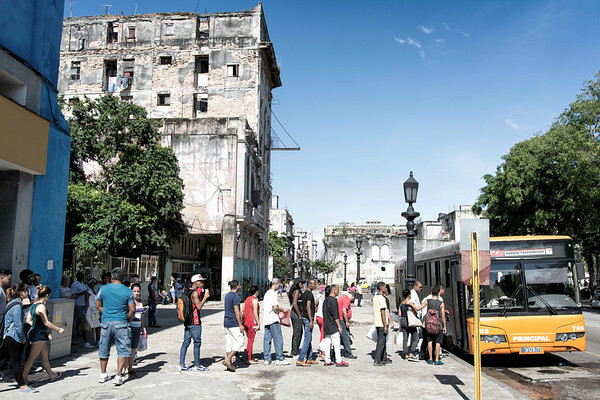 The city of lines; Havana is unmistakable." People walk down Águila St., near the capital, unfazed by the rubble around them. 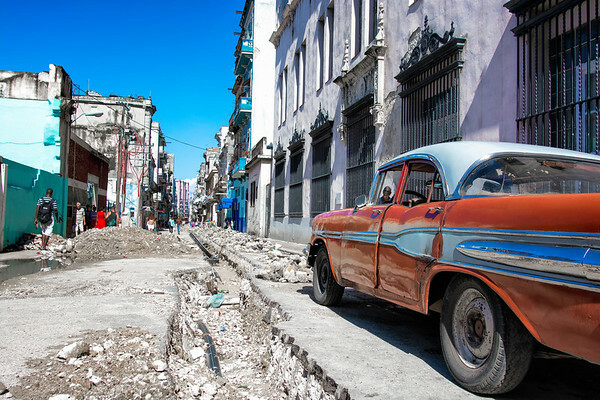 With a lack of money and resources, Cuba has been struggling to maintain it's infrastructure. It's been said that a building a day collapses in the city of Havana. 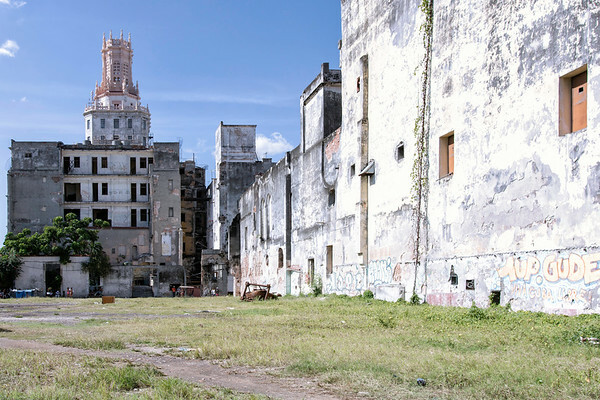 Recently however, the government has begun restoring many of the historical buildings in Old Havana to their former glory. With only one item on the menu, you won't be getting any spiced lattes here. Instead, enjoy the simplicity of a sweetened dark roast. Buy some Cuban coffee on the way through the airport and you can easily make it at home! Just add the first few drops of espresso to a teaspoon of sugar in a teacup and mix vigorously. Then add the remaining espresso to the creamy, light brown paste and mix. The light brown foam layer on top is called "espumita". Alternatively, one can add sugar directly to the espresso pitcher, hydrolyzing sucrose with high heat. Both methods create a syrupy buzz base for breakfast or dessert. Enjoy! Surprisingly, Cuba has lower infant mortality rates and longer life expectancy than the United States. Everyone in Cuba has access to free healthcare and there are a high proportion of doctors to the entire population. These classic cars may look like they are in mint condition from the outside, but don't be fooled. 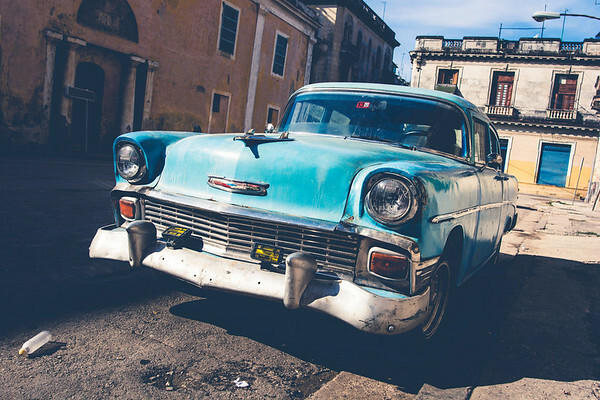 While Cubans take great care of their vehicles, these cars are not sitting in anyone's garage looking pretty. They are a means of transportation and have been used from the day they arrived on the island roughly a half century ago. For anyone looking to buy an American classic, look elsewhere. For most of these cars, the original motors are long since gone, often replaced with diesel engines and old tractor parts. 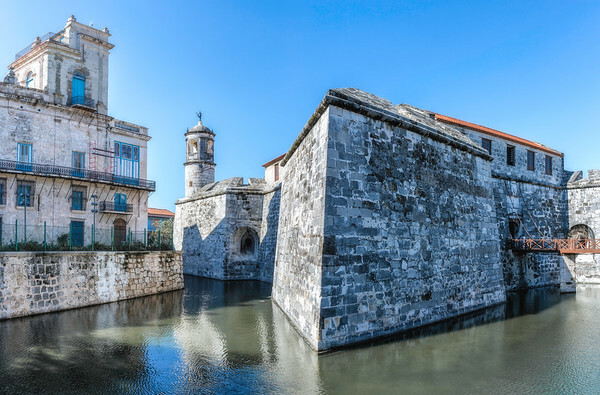 Thought to be the oldest stone fort in the Americas, Castillo de la Real Fuerza was originally built to protect the city from pirates. The fort is surrounded by a moat and shaped like a star to allow defense from all sides. However, it had one major flaw; it was built too far away from the harbor to effectively defend against pirates. So it quickly became the governor's residence. Since then it has been the National Archive, the National Library and is currently a museum. Cuba is a place that all American's could point to on a map, but today remains relatively unknown to most. What often comes to mind, especially with older generations, are memories of America's closest enemy: the Bay of Pigs, the Cold War, dilapidated buildings and Fidel Castro's oppressive socialist country. For decades, Cuba has been held back by the U.S. and its allies because of their cooperation with Russia. With limited imports, Cubans have been forced to use and maintain what they have had since the 1950's. 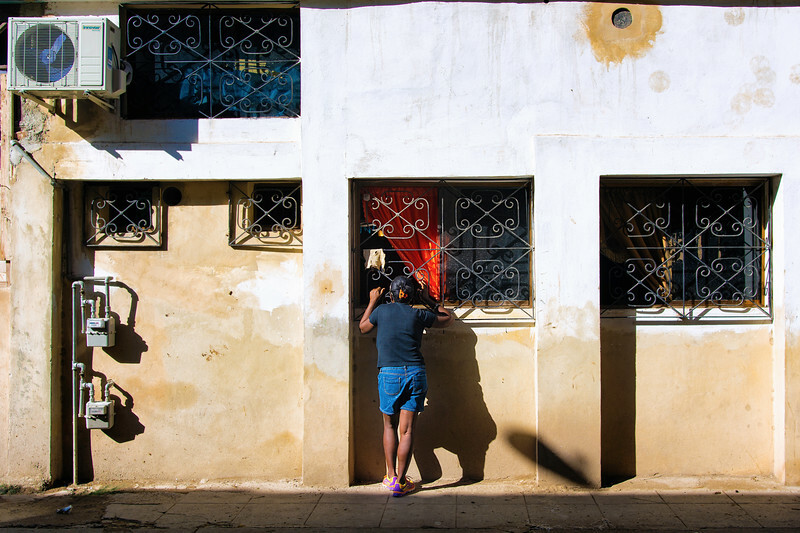 As a result, the country remains largely stuck in time and all Cubans have had to find creative new methods of accomplishing daily tasks, making them some of the most resourceful people on the planet. That all started to change In 2014, when President Barack Obama announced intentions to restore diplomatic relations between America and Cuba. Obama said his policy would, "open the door to travel and commerce." Since then, flights between the U.S. and Cuba have restarted, smartphones and limited internet access are available, and many U.S. companies are making plans for expansion into Cuba. "Cuba will certainly change in the coming years"
With these changes and many others, Cuba will certainly change in the coming years. However, this change may not be as quick as many have anticipated. Most Americans are still hesitant to travel to a place with travel restrictions and unknown safety. As a result, tourism has not yet increased as expected. Airlines are even scaling back the number of flights and the size of the planes traveling to Cuba. 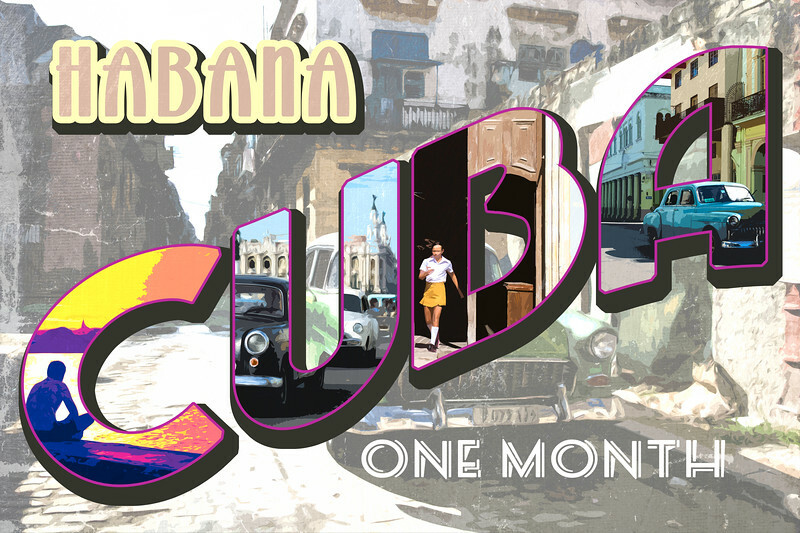 This means that there is still time to see Havana before it significantly changes. Enjoy friendly people, delicious food, classic cars, energetic music, pristine beaches, tropical heat and beautiful sunsets. For those considering traveling to Havana, Cuba, we hope that these images and captions will convince you to make the trip. We took a chance and explored the streets of Havana in December 2016 and are glad we did!